Photoshop Sketch is Adobe’s mobile app solution for raster drawing. The iOS app launched in 2015 has become increasingly popular amongst artists that are looking portable drawing solutions. It’s known for it’s simulated water color brushes and life-like pencil and charcoal brushes. 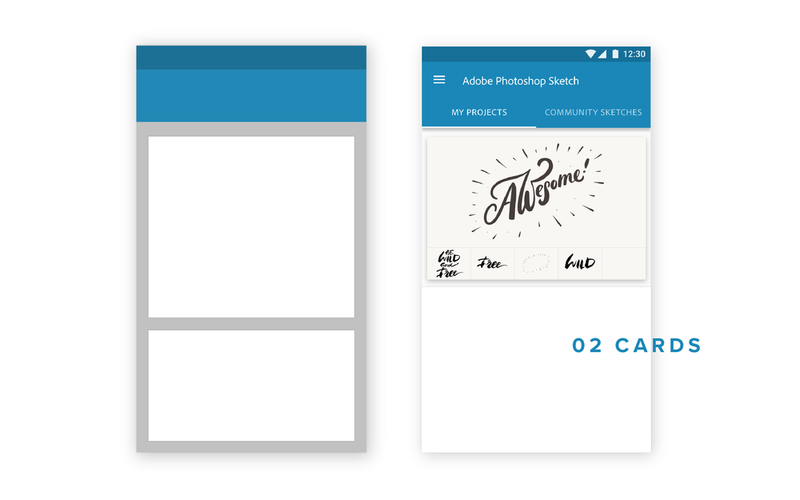 I was tasked to design the UI for Sketch’s debut on Android. The interface was to be focused around the layer support that was being worked upon in collaboration with the iOS designers. The app design had to be closely centred around Material Design principles and their interaction design patterns. Adobe Sketch for Android was launched at Adobe Max 2016. Tabs were used to segregate the two primary navigations: Project gallery and the community sketches library plugin through Behance. Cards were used as projects. A project head has 5 main documents that are displayed as part of the project card. One of the most important functionalities of this version was the introduction of layers. Bottom sheet and its principles formed a very important baseline for laying out the layer editing options. Tablet designs could accomodate larger canvas areas and more dialog based actions for better space management and more focus on the content. The iconography was one of the primary drivers to establish the Material design philosophy while keeping the experience similar to the iOS counterpart.